Beautiful contrast of white and indigo blue, and texture with the tension of cotton and silk, make a nice stole for the summer. Plant dyeing an unique dying technique nurtured by Japanese unique nature and culture over more than a thousand years. As this technique uses natural colors which can be extracted by natural material, even the same types of plant could create different color depending on season, which means one cannot be exactly the same with others. As this technique requires time and effort, this was initially developed to dye clothes of medieval aristocrats. Also, plant dyeing has a low strength against sunlight, sweat and washing etc. ; therefore, it was not suitable for modern mass production technology. However, plant dyeing has been well loved by those who love unique and natural texture which can only be created by nature. 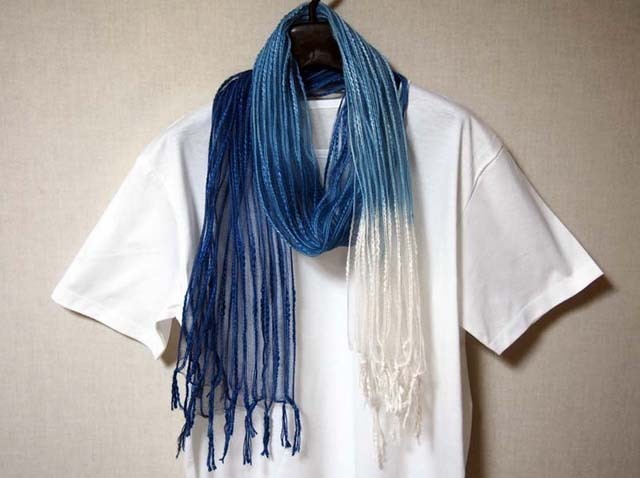 Recently, plant dyeing has been receiving people’s attention for its eco-friendly dyeing method. Dyes and mordant used for plant dyeing are both material exist in nature. After mowing indigo (an annual grass of polygonaceae), fermented and then dyed leaving gradation of contrasting shades. This stole is available from our ebay store. Please check price and details from the link. I hope you will enjoy having this product!